Everett Collection Mahatma Gandhi in 1931. To an American friend Romain Rolland has written as follows about the visit of Mahatma Gandhi to his home. –EDITOR THE NATION. How I should have liked to have you here during the visit of the Indians! They stayed five days–from Sunday night until Friday afternoon, the eleventh–at the Villa Lionette. The little man, bespectacled and toothless, was wrapped in his white burnoose, but his legs, thin as a heron’s stilts, were bare. His shaven head with its few coarse hairs was uncovered and wet with rain. He came to me with a dry laugh, his mouth open, like a good dog panting, and flinging an arm around me leaned his cheek against my shoulder. I felt his grizzled head against my cheek. It was, I amuse myself thinking, the kiss of St. Dominic and St. Francis. Then came Mira [Miss Slade], proud of figure and with the stately bearing of a Demeter, and finally three Indians, one a young son of Gandhi, Devidas, with a round and happy face. He is gentle, and but little aware of the grandeur of his name. The others were secretaries–disciples–two young men of rare qualities of heart and mind: Mahadev Desai and Pyarelal. As I had contrived shortly beforehand to get a severe cold on my chest, it was to my house and to the chamber on the second floor where I sleep at Villa Olga–you will remember it–that Gandhi came each morning for long conversations. My sister interpreted, with the assistance of Mira, and I had also a Russian friend and secretary, Miss Kondacheff, who took notes on our discussions. Some good photographs by Schlemmer, our neighbor from Montreux, recorded the aspect of our interviews. Evenings, at seven o’clock, prayers were held in the first-floor salon. With lights lowered, the Indians seated on the carpet, and a little assembly of the faithful grouped about, there was a suite of three beautiful chants–the first an extract from the Gita, the second an ancient hymn on the Sanskrit texts which Gandhi has translated, and the third a canticle of Rama and Siva, intoned by the warm, grave voice of Mira. 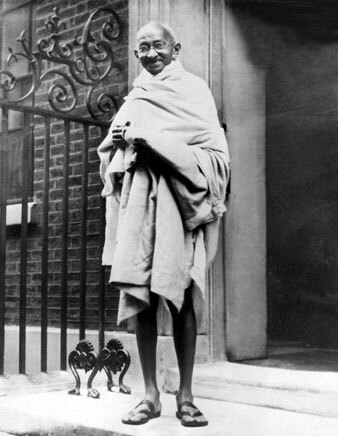 Gandhi held other prayers at three o’clock in the morning, for which, in London, he used to wake his harassed staff, although he had not retired until one. This little man, so frail in appearance, is tireless, and fatigue is a word which does not exist in his vocabulary. He could calmly answer for hours the heckling of a crowd, as he did at Lausanne and Geneva, without a muscle of his face twitching: Seated a table, motionless, his voice always clear and calm, he replied to his adversaries open or masked–and they were not lacking at Geneva–giving them rude truths which left them silenced and suffocated. The Roman bourgeoisie, militarist and nationalist, who had at first received him with crafty looks, quivered with rage when he left. I believe that if his stay had lasted any longer the public meetings would have been forbidden. He pronounced himself as unequivocally as possible on the double question of national armaments and the conflict between capital and labor. I was largely responsible for steering him on this latter course. His mind proceeds through successive experiments into action and he follows a straight line, but he never stops, and one would risk error in attempting to judge him by what he said ten years ago, because his thought is in constant evolution. I will give you a little example of it that is characteristic. He was asked at Lausanne to define what he understood by God. He explained how, among the noblest attributes which the Hindu scriptures ascribed to God, he had in his youth chosen the word “truth” as most truly defining the essential element. He had then said, “God is Truth.” “But,” he added, “two years ago I advanced another step. I now say, ‘Truth is God.’ For even the atheists do not doubt the necessity for the power of truth. In their passion for discovering the truth, the atheists have not hesitated to deny the existence of God, and, from their point of view, they are right.” You will understand from this single trait the boldness and independence of this religious spirit from the Orient. I noted in him traits similar to Vivikananda. And yet not a single political ruse catches him unprepared. And his own politics are to say everything that he thinks to everybody, not concealing a thing. On the last evening, after the prayers, Gandhi asked me to play him a little of Beethoven. (He does not know Beethoven, but he knows that Beethoven has been the intermediary between Mira and me,* and consequently between Mira and himself, and that, in the final count, it is to Beethoven that the gratitude of us all must go.) I played him the Andante of the Fifth Symphony. To that I added “Les Champs Elysées” of Gluck–the page for the orchestra and the air for the flute. Here, my dear friend, are a few hints of those days of ours together on which I have taken much more detailed notes. What I do not dwell on to you is the hurricane of intruders, loiterers, and half-wits which this visit loosed on our two villas. No, – the telephone never ceased ringing; photographers in ambuscades let fly their fusillades from behind every bush. The milkmen’s syndicate at Leman informed me that during all the time of this sojourn with me of the “King of India” they intended to assume complete responsibility for his “victualling.” We received letters from “Sods of God.” Some Italians wrote to the Mahatma beseeching him to indicate for them the ten lucky numbers for the next drawing of the weekly national lottery! My sister, having survived, has gone to take ten days’ rest at a cure in Zurich. She returns tomorrow. For my part, I have entirely lost the gift of sleep. If you find it, send it to me by registered mail!